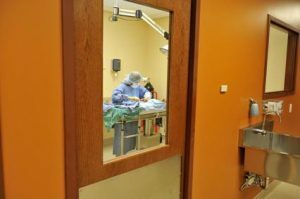 Rogue Valley Veterinary Hospital offers complete surgical care for your pets. 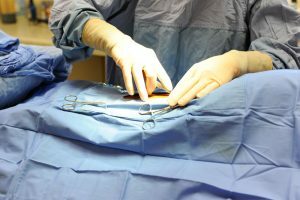 Our doctors are able to perform preventive surgeries, as well as, advanced orthopedic and soft tissue surgery in our sterile surgical suite. We offer the safest anesthesia available and monitoring technology to help ensure your pet’s safety during and after surgery. All surgical patients receive an IV catheter and IV fluids for the duration of their surgery, which keeps them well-hydrated and helps them recover faster. Post-operative pain medication will ensure your pet recovers comfortably. During recovery, pets are closely monitored by our licensed technicians. Prior to surgery, all pets are required to have a thorough examination performed by the veterinarian. We recommend pre-anesthetic blood testing to gather information of any underlying conditions. Our veterinarian will provide you with a treatment plan, estimate of costs, and will schedule your pet’s surgery admittance appointment time. 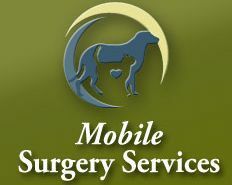 At surgery admittance, the technician will review your contact information, review any changes in your pet’s health status, and will review the estimate of the treatment cost with you. You will have time to ask any questions you may have about the procedure. Our surgery technician or the doctor will call you to give a progress report on your pet’s status as your pet is recovering from anesthesia. When your pet is discharged from the hospital, you will be informed about any needed post-operative or physical rehabilitation care. You can make a difference! Every year, millions of unwanted dogs, cats, puppies, kittens are euthanized. By sterilizing your pet you will prevent unwanted births and enhance your pet’s quality of life. The surgery eliminates behavioral problems associated with mating instinct. These undesirable behaviors may include: female aggression in dogs due to cycle, urination and yowling in cats due to heat cycle, marking behavior in male dogs and cats, roaming and aggression based on mating behavior. In addition to eliminating undesirable mating behavior, spaying and castration also helps to prevent some serious health concerns such as: prostate disease, ovarian and testicular cancer, pyometra (a life threatening uterine infection due to hormonal influences), and can reduce the odds of your dog developing breast cancer by as much as 90%! Consult with one of our veterinarians about the most appropriate time to spay or neuter your pet. Following your puppy’s or kitten’s initial series of wellness vaccination visits, we offer a complimentary office visit with our fully licensed, surgically experienced veterinary technicians prior to scheduling your pet’s surgery. Our technicians will answer your questions, explain the procedure, give you a treatment plan specific to your pet’s needs and will provide you with a full estimate of the costs for services. Your pets’ oral health is essential to their physical wellness. A clean, healthy mouth is important and can help ensure overall health for your pet. NO PET IS TOO OLD FOR A DENTAL! Bad breath, red, inflamed, swollen gums, and/or tartar build up on the teeth. Yearly veterinary exams including oral examination is key to identifying these problems early. Tartar and plaque build-up on the teeth can cause gingivitis (inflammation of gums) and infection. This can lead to bone loss in the jaw, tooth abscesses and even systemic infection, including heart disease, kidney problems, and liver problems. Untreated dental issues are not only bad for the health of your pet but can be extremely painful. A complete oral exam is performed, including measuring of peridontal pockets, gum recession, and status of gingival tissue. Gingival, and sub-gingival, ultrasonic scaling is performed. All teeth are polished and fluoride treatment applied. If necessary, extractions are performed with local anesthesia for added pain control by a licensed veterinarian. All dental procedures require general anesthesia and a veterinarian will examine the pet prior to being anesthetized. Our dental procedures include: daytime hospitalization, safe anesthesia methods and monitoring, full oral health exam, ultrasonic scaling, polishing of all teeth, and a fluoride treatment. Dental xrays can also be performed to reveal any existing problems under the gums that cannot be seen by examination. Dr. Mair’s veterinary education was obtained at Michigan State University in 1999. She successfully completed an internal medicine internship and surgery residency at the Tufts Cummings School of Veterinary Medicine in Massachusetts. Upon completion of her residency in July 2003, she accepted a full time surgery position at VCA Northwood Hospital in Indiana. She became a diplomate of the American College of Veterinary Surgeons in 2005. August 2008 She had moved back to Michigan and began her Mobile Surgery Service, as well as working at Veterinary Care Specialists in Milford, MI. Prior to veterinary school she attended Western Michigan University in Kalamazoo, MI where she obtained a degree in finance and economics after which she completed my Masters of Business Administration. She was employed by the Chubb Group of Insurance Companies from 1989 through 1995. Veterinary medicine is a second career for me. I truly feel blessed to have found a profession that I love. My goal is to develop a strong relationship with veterinarians referring cases as well as veterinarians that have me perform surgeries in their clinics. My promise is to always do my best for you and your pet. In the end, the most important goal is a successful surgical outcome. I’ll be there to help you achieve this end.